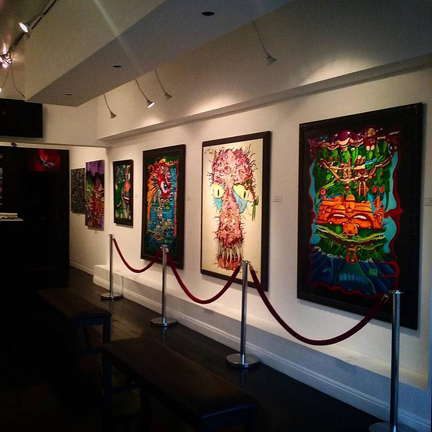 Stone Malone returns home to his Gallery on August 13th with his Solo Exhibition "Resurrection!" New Stone Art for 2016...Oh Joy...Everybody must GET STONE! "Nevada Stone Garden" is in Art Prize! Nevada Stone Garden is in Grand Rapids Michigan.......so where's Stone? This is the first entry into Art Prize for Stone Malone, a Grand Rapids native. "I always wanted to do a Gallery Exhibition in my home town" well what if you win Art Prize Stone? "If I win I will make a trip back to Michigan to celebrate" You can go online and vote for Nevada Stone Garden....remember a vote Stone is a vote for the Gallery! Mastermind was formed by guitarist Stone Malone in the late 80’s early 90’s. They called Grand Rapids Michigan their home, and they owned the speed metal scene until forces beyond their control changed their fate forever. This documentary is a brief glimpse into the metal scene of West Michigan, before Metallica ruled the world. We hope you enjoy this film! Drugs and crazy times split the band into pieces….but the few that survived, remember the days of mayhem and fun Mastermind caused! As for the band members and their whereabouts…this is all we know. ***Stone Malone*** (Lead Guitar) moved to LA in 1991, he owns an Art Gallery in Hollywood called The Stone Malone Gallery. Stone still plays music and recorded a two CD’s in his band Stone & the Assassins! You can look him up at www.stonemalone.com or www.stonemalonegallery! ***Matt Schaab*** (Vocals) still lives in Michigan. He got into rap and started to fuse Rap-Thrash 25 years ago, now its common place. A true pioneer Matt still writes music and continues to evolve his style. ***Vito Lange*** (Rhythm Guitar) continued to play guitar at a high level…although we lost touch with him many years ago the rumors prosiest? If anyone knows please contact Stone at stone@stonemalone.com! ***Chris Clark*** (Bass) was a Cliff Burton prodigy. We found out a few years ago that he had passed, it’s so sad because he was a very sweet kind man! RIP my Brother! ***Greg Downs*** (Drums) Is mainly a singer songwriter, who plays guitar now! They no longer play together, but this film preserves their legacy…..long Live MASTERMIND! 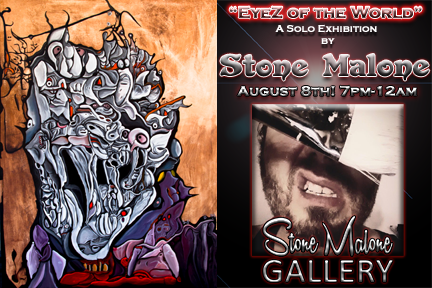 "EyeZ of the World" A Solo Show by Stone Malone! 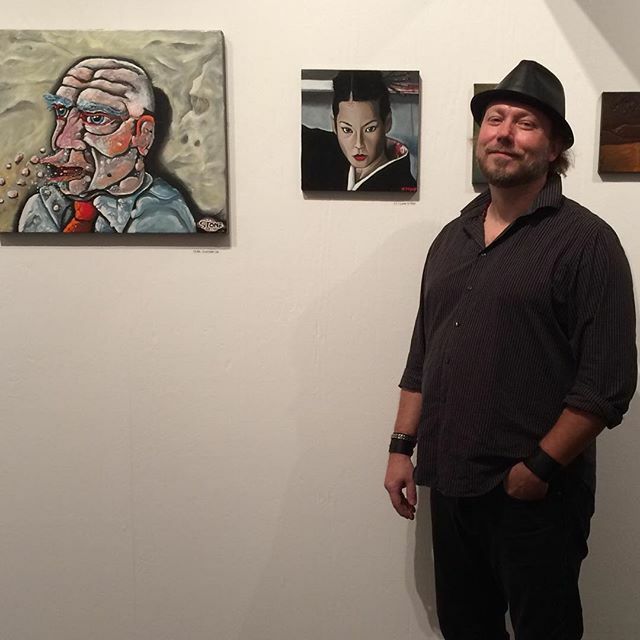 Gallery Owner and founder Stone Malone returns Home for his once a year Exhibition at the Stone Malone Gallery! "EyeZ of the World" brings new Stone Art to the Earth, always a thrill to see the new creations by Mr. Malone. 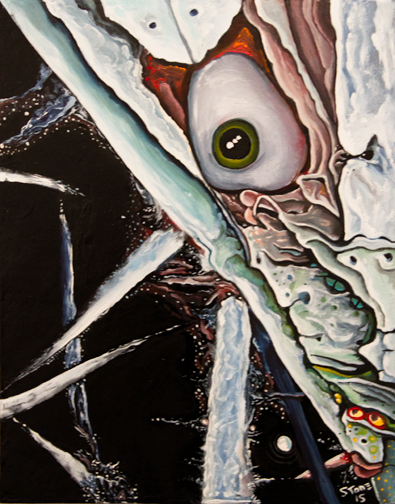 This group of work is better than last years work, and continues the evolution of this this Artist's skills and vision! Welcome to the New Stone Malone Website! New Look New Life.......Hello, Welcome here....you made it! Much Love STONE!